Pets Costs > Cats > How Much Does Adopting a Cat Cost? How Much Does Adopting a Cat Cost? Adopting a cat is a process where a homeless cat is legally adopted by an individual from a shelter that provides the cat temporary care. Cats from shelters are usually rescued and come from different places such as the streets or if someone were to abandon it at the shelter. Adopting a cat rather than buying one can definitely save you money as the cost for adopting a cat is very minimal. The price for adopting a cat usually just depends on the shelter you choose. Adopting a cat rather than buying one can definitely save you money as the cost for adopting a cat is very minimal. The price for adopting a cat usually just depends on the shelter you choose and cat. Kittens, for example, will cost 20 to 40 percent more than a disabled older cat. On average, most shelters will charge anywhere from a small donation fee to around $150, but most of the time, it won’t be more than $150. Since most of these rescues and shelters are non-profits, the money can be tax deductible. PetSmart, for instance, holds adoption events every weekend and most adoption fees, depending on the local group, will cost about $50 to $100. According to Catster.com, the price for adopting a cat ranges from $30 to $200. TheCatSite.com says the average price to adopt a cat will often be between $50 and $150. On CNN Money, they said the costs will depend on the shelter and the breed of cat you want to adopt. For example, the kittens will cost more than the adult cats because the kittens will take more time to take care of. Plus, when people are looking to adopt a cat, they often want to adopt a kitten, not a grown adult. The article also notes that breed specific rescue groups will charge more than a shelter group that doesn’t focus on a specific breed. On average, fees can be as little as $25 to close to $300. Before you can even adopt a cat, the adoption agency will ask you to fill out paperwork, which will include personal information, your experience with pets and other crucial information. With this paperwork, they will then decide if you’re a good fit for the adoption process. Most shelters today should neuter or spay the cat free of charge, and they do this in hopes of limiting the number of stray cats. If unsure, be sure to ask the rescue group about what they do to their cats before they are sent out for adoption. In California, for example, they require pets are spayed or neutered before they leave the shelter. Like a breeder, the adoption agency should also include a health check-up by a vet, up-to-date vaccinations, such as a distemper shot, deworming, testing and a 30-day health guarantee. Some adoption centers may also include a follow-up visit in the future with their in-house vet clinic. 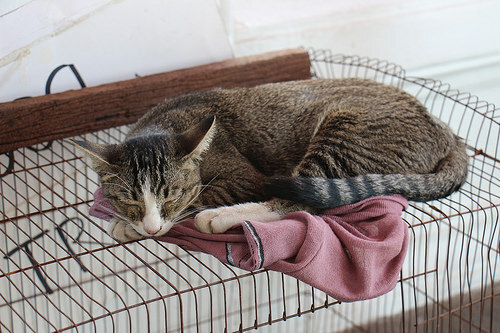 For example, on the website we mentioned earlier, The Cat Site, they had interviewed a cat shelter and they said they would include a rabies shot, two distemper shots, two de-worming sessions and will be tested for feline leukemia and AIDS. They also include a microchip and spay or neutering. Many shelters will also include a startup kit that may include a small bag of cat food, toys, and coupons for future purchases. The ASPCA has a list of what’s to be expected maintenance wise when the cat is adopted. These recurring fees are going to include things such as cat litter, medical expenses, toys and food. Cat owners should plan on budgeting at least $500 to $700 per year for annual maintenance, but it could be much higher than this if surgery were required. A microchip, while not included with the adoption fee, can be included before you take your cat home. Many shelters can offer a buy one get one free or half off type deal when more than one animal is adopted at once or may offer a discount to those who are older than 62. Be on the lookout for special deals or “specials” when they drop the adoption fees. Consider checking out major pet chains such as Pet Smart to see what kind of animals are available. These pet stores will often hold massive events on weekends that bring most of the local breeders together.